A geomagnetic storm on January 17, 2013, provided unique observations that finally resolved a long-standing scientific problem. 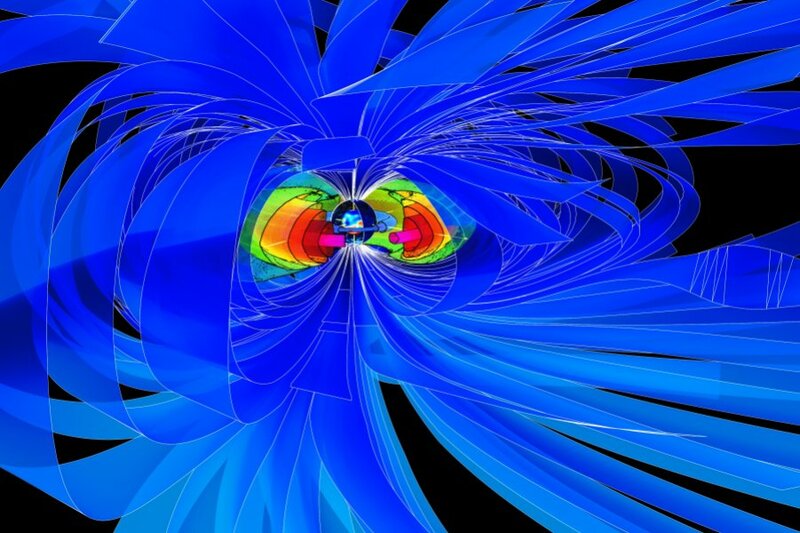 For decades, scientists had asked how particles hitting Earth’s magnetosphere were lost. A likely mechanism involved certain electromagnetic waves scattering particles into Earth’s atmosphere. More recently, another mechanism was proposed that caused particles to be lost in interplanetary space. Yuri Shprits from the GFZ German Research Centre for Geosciences and the University of Potsdam, together with colleagues from several institutions, recently found that both mechanisms play a role affecting particles at different speeds. Visualization of Earth’s magnetic environment, with the magnetic field as a protective shield, generated by the strong internal magnetic field in Earth’s core (for more see the end of the press release). “This study resolves some fundamental scientific questions about our space environment and may also help understand fundamental processes that occur elsewhere in space, on the Sun, in outer planets, distant galaxies, and exoplanets,” says Yuri Shprits. He adds: “This study will also help us predict and now-cast the space environment and protect valuable satellites in space.” The study will appear in Nature Communications. Using measurements from the first US satellite mission, Explorer 1, launched on January 31, 1958, physicist James Van Allen discovered that space was radioactive. Earth is surrounded by two donut-shaped regions of very high particle radiation nested in each other that are referred to as Van Allen Radiation Belts. The high-energy particles that populate the belts create a very harsh environment for satellites and humans in space. Having very high energy and flying at a speed very close to the speed of light, these particles can induce differential charging on the surface or inside the spacecraft and cause numerous satellite anomalies for telecommunication, navigation, scientific, and Earth-observing satellites. The particles that are most difficult to protect spacecraft from are relativistic and ultra-relativistic electrons. In recent years, there has been much interest in understanding the Van Allen Radiation Belts. Now more than ever, we rely on technology in space. New technologies of electric orbit raising now require telecommunication satellites to spend a very long time in the Van Allen belts and GPS satellites to operate right in the heart of the belts. Increased miniaturization of space electronics makes satellites more vulnerable to space radiation than ever before. While it is possible to increase satellite shielding and protect the satellites from relativistic particles (speeds of greater than 0.9 of the speed of light), shielding from ultra-relativistic particles (speeds of greater than 0.99 of the speed of light) is practically impossible. Understanding the dynamics of these particle populations has been a major challenge for scientists since space radiation was discovered over half a century ago. Early observations showed that the belts are very dynamic. Unlike oceans and atmospheres that do not change significantly in short time scales, fluxes of particles in the radiation belts can change by up to a factor of 1000 in a matter of hours or less. The most dramatic are so-called dropouts that often occur during geomagnetic storms that are caused by the solar flares or fast solar wind from the coronal holes. Since the end of the 1960s and the beginning of the 1970s, much research has been devoted to understanding the loss of electrons from the Van Allen belts. Scientists studied observations from the ground, balloon observations of X-ray bursts and in-situ observations. The loss mechanisms remained elusive and not well understood. “And yet understanding of loss processes is required to specify the radiation environment and develop models that can now-cast and forecast the radiation environment,” says Yuri Shprits who recently joined the GFZ German Research Centre for Geosciences in a joint appointment with the University of Potsdam. One of the proposed theories was that particles are scattered into the atmosphere by Electromagnetic Ion Cyclotron Waves (EMIC). These waves are produced by the injection of ions that are heavier than electrons and carry a lot of energy. These waves can potentially scatter electrons into the atmosphere. Up until recently, that remained the most likely candidate for the loss of electrons. In 2006, another mechanism was suggested by Yuri Shprits and colleagues. In this mechanism, particles were lost to the interplanetary space, which resulted in the depletion of particle density and the outward diffusion of electrons. This theory received much attention, and a number of studies provided observational evidence for this loss mechanism. The modeling of the bulk populations of electrons at relativistic energies also seemed to favor this mechanism and did not require additional loss processes by EMIC waves. It remained unclear which mechanism operated or dominated during storms, but did explain the most dramatic dropouts of population in the space environment. Even increased detailed multipoint satellite observations that have been available since the launch of NASA’s Van Allen Radiation Belt Storms Probe seemed unable to provide definitive answers. Real loss of particles may be difficult to infer as it may be masked by variations associated with the variations in the magnetic field or competing acceleration mechanisms that may operate differently at different energies. Furthermore, both proposed loss mechanisms are intensified during storms, making it very difficult to distinguish one from another. Scientists tried to isolate different processes from each other, but the task seemed to be practically impossible to accomplish. “The unique combination of events that occurred before and during the January 17, 2013 geomagnetic storms finally allowed us to definitively resolve this long-standing scientific question,” says the lead author of the study, Prof. Yuri Shprits. The combination of conditions during the January 17, 2013 storms provided a very unique coincidence of different factors that finally allowed scientists from GFZ, University of Potsdam, UCLA, Stanford, Berkeley, Augsburg College, LASP, UNH and Sodankylä Geophysical Observatory.to resolve this long-standing scientific problem. Among the lucky coincidences that helped researchers was: 1) that the belts were populated by a previous storm which allowed detectors to measure detailed distributions of particles in space, energy and direction of propagation during this storm; 2) that the most intense fluxes of relativistic and ultra-relativistic were at different locations in the belts, and therefore particle populations did not affect each other; and 3) ultra-relativistic particles were located deep inside the magnetosphere and were not affected by the loss to the magnetopause. Detailed measurements on Van Allen Probes showed that EMIC waves were indeed scattering particles into the atmosphere but only affected ultra-relativistic electrons while not affecting relativistic particles that were considered in many previous studies. At ultra-relativistic energies, electrons fly extremely close to the speed of light, and in their reference frame rotate around the field line in the same sense as waves. Being in resonance with electrons, waves can very effectively scatter ultra-relativistic elections into the atmosphere. Distributions in radial distance, energy and direction of velocity all provided definitive evidence that this mechanism of loss is most efficient at ultra-relativistic energies. Detailed modeling including EMIC waves showed remarkably good results, basically identical to the observations, once again confirming the conclusions of the study. This study resolves some fundamental scientific questions about our space environment and may also help understand fundamental processes that occur elsewhere in space (on the Sun, in outer planets, distant galaxies, and exoplanets). Yuri Shprits adds, “This study will also help us predict and now-cast the space environment and protect valuable satellites in space. It may also help develop methods of cleaning up the radiation belts from harmful radiation and make the environment around Earth friendlier for satellites.” The study involved two GFZ graduate students Irina Zhelavskaya and Nikita Aseev. Web Source: Helmholtz Centre Potsdam – GFZ German Research Centre for Geosciences.